Today’s 15-24 year old men live a fluid and dynamic life. They are open to changes and have a forward-looking spirit. They want to be actors of their lives and play the game of seduction. This is why United Colors of Benetton perfume has designed a new product range especially for “athletic and self-confident” guys who want to live their life following their sportive style. These products come in a bottle shape directly inspired by water bottles, perfectly fitting the sporty attitude. Let's Move was developed by perfumer Olivier Pescheux; notes include bergamot, mandarin, black pepper, geranium, lavender, cedar, amber, tonka bean and vanilla. 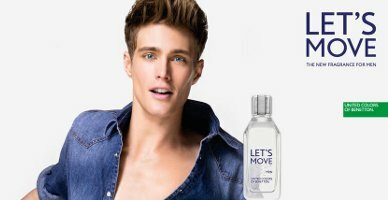 Benetton Let's Move is available in 40 and 100 ml Eau de Toilette. “15 -24 year old men”? Sorry, but there is no such thing as a 15-year-old man. I’ve seen fragrances described as for “young girls”, but never for “boys” that I can remember! True, but then they could have said “15 to 24 year old guys”. They did use the word guys later in the ad copy. The list of notes sounds interesting to me, some of my old favourites are listed there. I might want to try it. But I just don’t get the whole concept. Who says that young 15-24 year old man have to carry a dynamic, sporty life? Come on, I’m 22 and my life is not dynamic, nor sporty. I rather prefere classic & elegant style and I live my life with these values. …and I don’t even look like this model… sic. It’s the year of the sport fragrance. At least they didn’t put “sport” in the name. Hate to say it, but that doesn’t sound like actual ad copy so much as in-house marketing notes that would be used to guide a campaign. The idea that such notes might have atually been used as real copy makes me laugh. Probably true, since they come from the license holder, not a commercial website.